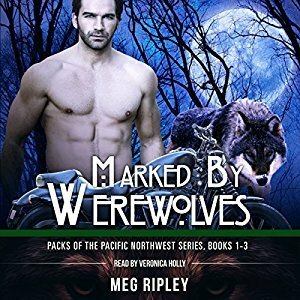 I received an Audible credit for a copy of Meg Ripley’s Marked by Werewolves box set. They’ve messed with the wrong chick this time. I don’t usually use star ratings on the blog, though I often begrudgingly assign them when I cross-post to other sites. But for this one, I think I need numbers. Overall, I’d give this compilation a 2.25. But I’ll discount the first ‘book’ and its rating and round up to 3. Below you’ll find my thoughts on the individual books. Veronica Holly did a fine job with the narration. I noticed a couple hiccups toward the end, but not enough to really bother me. Not a story, barely even a prologue. If I was incline to rate it on its own, as opposed to part of the boxed compilation of books 1-3 I have, it would be very low indeed. It’s basically useless on its own. Better than the first two “books.” I put that in quotation marks because “book 1” isn’t a book by any definition I can imagine and I’m irritated by this trend authors seem to be developing of publishing teasers without accurately labeling them as such. But none of these stories stand alone, so I can’t just pretend it didn’t exist. Either way, The Wolf Pack’s Revengeis an improvement. The writing is better and it was a more complete story than either of the previous stories. The characters were still shallow, though I have to admit to liking how caring the heroes are (no alpha A-holes). The plot was still thin. But it is still only a novella, so what can I expect. All in all, ok if you like this sort of pared down story. This entry was posted in books/book review and tagged audio book, book review, werewolf on August 31, 2017 by Sadie. 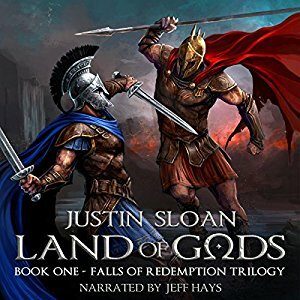 I received an Audible copy of Justin Sloan‘s Land of Gods. I believe I requested it when the author was offering codes for free. In a world where men believe they can become gods, Narcel searches for his missing brother while trying not to let the girl of his dreams slip away to his older cousin. Evidence for his brother’s disappearance points to the rival warrior clan, the Mawtu, a viscous group of warriors… which could mean only one thing: war on the horizon. The FALLS OF REDEMPTION trilogy: A young man is forced to become the warrior he never wanted to be, attempts to earn the love of a woman he seems destined never to get, and struggles to find himself in a world of betrayal and intrigue. Sigh, I think this was a case of wrong book for the wrong reader, because while I have no issue with the violence or even that the plot just kind of plodded along, the feminist in me couldn’t not notice the treatment of females in the story. I’ll grant that one of the leaders was female and that’s a plus. But she was virtually characterless. Other than her, every single woman was there to be sexually available. Maybe they were all meant to be prostitutes, I don’t know, but it was very noticeable. Then there was Kaire, the love of the main character’s life. She was just an object, a prize for two men to fight over. But that wasn’t what sent me into a froth though. What got my goat was the way she was supposed to vacillate between two men. I can see what the author was TRYING to do. Unfortunately I cannot express how poorly he accomplished his goal. The problem was that Sloan’s characters were as subtle as a sledge hammer, making one a “good man” and one a “bad man.” So, Kaire’s affections for the bad man made no sense. She’d have to be very, very stupid to honestly not see it and she wasn’t supposed to be. Sloan tried to do too much. She was supposed to love one man with all her heart, but still want the second guy. (I kept hoping that she was playing some deeper game, a spy or something.) It made no sense, was not believable and basically ruined the book for me. It’s the same sort of dissonance Sloan created when he tried to convince readers a person would change national and familial loyalties and become a perfect warrior in six months, but also still be loyal to their homeland. You just can’t do both. So, this whole book was full of contradictions that made no sense to me. I also lost track of the time line, so people’s ages. But none of them seemed old enough for what they were doing. And I felt quite a lot was left unexplained. Why, for example, did Narcel kill Jordan? What is the ‘room of contemplation’ (or something like that)? The writing itself is fine and Hays did a fine job with the narration. I imagine guys (who are less likely to be attuned to the poor/stereotypical use of gender in the book) will like it a lot more than me. I gave the author a try and, while they’re a fine writer, they’re not for me. This entry was posted in books/book review and tagged audio book, book review, soldiers on August 29, 2017 by Sadie. 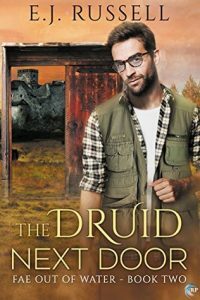 I received a copy of E. J. Russell‘s The Druid Next Door through Netgalley. I read and reviewed the first book in the series, Cutie and the Beast, last month. This was cute in much the same way as book one of the series, but this one I had a hard time liking. In fact, I didn’t. There is a real dominance and submission theme in it that I never got comfortable with. I considered it coerced. Period. Russell tried to dress it up as something else, but I couldn’t get comfortable with the power dynamic. I considered it essentially slavery and was basically disgusted with it. I totally see that Russell was going for something else, but I never got there. Plus, it required about a 180 degree shift in one character’s personality that I didn’t at all feel believable and the second character I didn’t feel I got to know well enough to judge, but it didn’t feel right for him either. So, fail for me. Outside of that issue, there is no romance (just coerced lust, IMO). The quest/mystery was amusing and I enjoyed that aspect of the book. But it was the smaller portion, to be sure. The writing and editing were fine, as far as I was concerned. I’m sure others will like it. I just couldn’t. This entry was posted in books/book review and tagged #DiverseRomanceBingo, #ReadDiverse2017, book review, fantasy, M/M, romance on August 29, 2017 by Sadie.